Gouache on paper, 6 3/8 x 8 7/8 in. Inscribed (at bottom center): New York, from Hoboken. EXHIBITED: Hirschl & Adler Galleries, New York, 2011–12, The World of Duncan Phyfe: The Arts of New York, 1800–1847, not in cat. 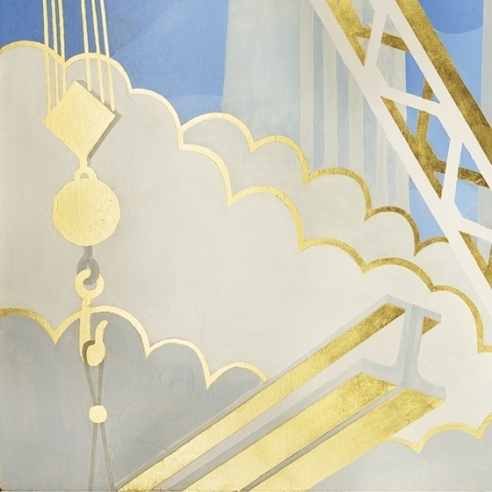 New York from Hoboken is one of a series of cabinet-size gouaches from Calyo’s hand that explores, with gem-like clarity, the same artistic and iconographic concerns that characterize his larger views. In the present work Calyo assumes his preferred observation point, the far shore of a body of water offering the prospect of a cityscape that is the avowed subject of the composition. The foreground, then, serves as an opportunity for the artist portray a genre or narrative scene. 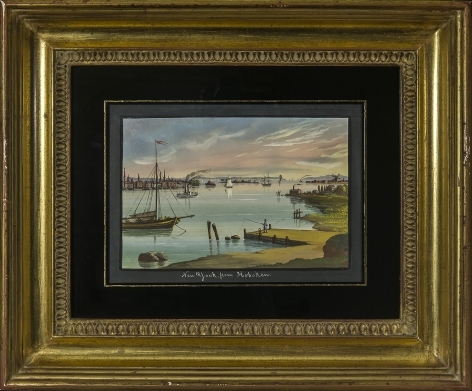 Seen from a semi-rural bank across a body of water, the foreground is devoted to river and bay traffic — fishing boats, sailboats and a steamboat. A lone fisherman casts his line into the calm water off a New Jersey dock. The church spires and tightly packed buildings of Manhattan loom directly across the Hudson River, while the imposing red sandstone Castle Clinton juts protectively 100 yards out into New York Bay, thus marking the days before 1848, when work on a landfill to surround it and create Battery Park was begun. Governor's Island sits in the mouth of the East River toward the center of the picture. On the near shore, toward the south, a built-up area with a windmill may be Bayonne. Beyond, on the horizon, lie the blue, hazy hills of Staten Island. Due west, boats ply the Narrows, and on the other side, the Brooklyn shore line stretches, seen in the distance and running from Fort Hamilton to Brooklyn Heights. Calyo executed a large (23 1/2 x 32 in.) 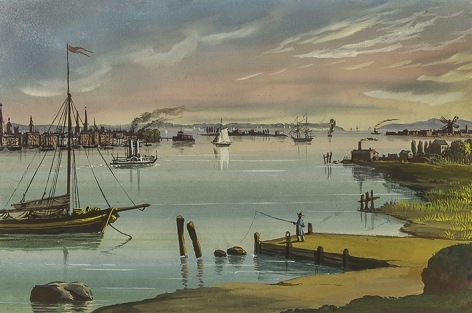 gouache view called New York from Hoboken that is in the collection of the New-York Historical Society (illus. in Richard J. Koke, American Landscape and Genre Paintings in The New-York Historical Society , I, p. 133 no. 284). 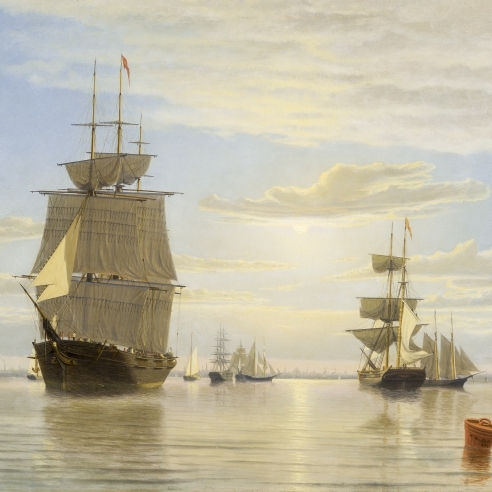 Although the larger work shares some similarity of viewpoint, the New-York Historical Society's gouache has an entirely different agenda, with details of topography subordinated to the drama of a stormy day with rough seas and a double-masted sea-going vessel in distress.